Ok ‘Chevelle’ fans...this BAD bunch is all muscle. 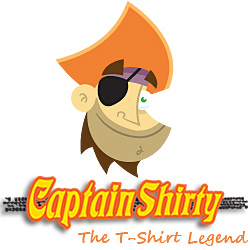 Highly detailed artist’s impression of the large artwork as shown above, on the back of this Tee. 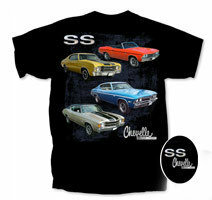 On the left side chest area of the this Tee, we have the brilliant artwork of the scripts ‘Bad SS Chevelle by Chevrolet’ in chromium font with a ‘trible pattern’ in the back ground in faint Charcoal. The artwork is of the Chevelle family from ’68 to ’72, introduced by Chevrolet. The artwork is finished off with the large scripts ‘BAD SS Chevelle by Chevrolet’ in Chromium effect, above and below the art work. Faint Charcoal coloured ‘Trible’ art work completes the back ground. Tee shirt Colour: Available in Black only, with Genuine GM Official Licensed Merchandise Tag.